Congratulations to senior Travis Headapohl and junior Lynnlee Duck-Reynolds on competing at the California Cross Country State Championships on November 28th at Woodward Park in Fresno. Earning a spot in the state meet is an impressive accomplishment in itself - less than one percent of high school teams or individual runners qualify - and Travis and Lynnlee not only competed, but set new personal records on the 3.1 mile course. 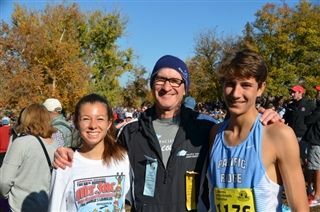 Lynnlee finished in 21:22, cutting more than three minutes off her state meet time two years ago, while Travis set the Pacific Ridge state meet course record by almost a minute with his 17:12 finish. This season, Lynlee improved her personal record on every subsequent course and Travis now holds school records on all courses but one. Great season, Firebirds!